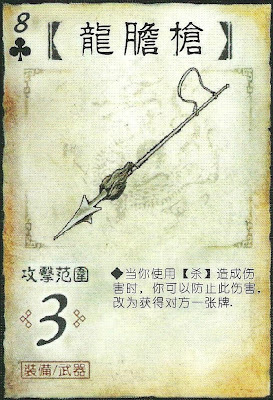 When an attack hits its target, instead of causing damage, the attacker can choose to take a card from the target. The attacker can take either a hand card or an equipped card, but not a pending card. The taken card goes into the attacker's hand. The function is similar to that of the Ice Sword. Even if more than one unit of damage was going to happen, only one card is taken.